Lewis Powell III alternates with FInley Polynice in the role of the Genie in Aladdin DLE this weekend at LATC. In an electrifying reprisal of a show staged earlier this year at Casa 0101 Theater in Boyle Heights, TNH (Teatro Nuevos Horizontes) Productions opened its uniquely visionary take on Disney’s Aladdin Dual Language Edition to deafening applause, unabashed laughter and screams of delight from children and grown-ups alike at the Los Angeles Theater Center (LATC) in downtown Los Angeles last Friday. With more ample stage room, a concert caliber sound system, costumes by designer and art director Abel Alvarado that could have been lifted directly from an “Arabian Nights” runway fashion show, and an impressive, other-worldly set by Marco Del Leon, the English-Spanish Aladdin adaptation reboot did not disappoint. On the contrary, billed as an expanded, more spectacular version of the production which debuted in January this year to critical acclaim on L.A.’s East Side, the limited-engagement, encore LATC production was met with similar enthusiasm by a near capacity opening night crowd. Deftly delivered as a bilingual love story and a magical adventure with a contemporary twist by director Rigo Tejeda, Aladdin Dual Language Edition soars in its temporary new home on Spring St. between 5th and 6th Streets in the heart of LA’s downtown arts district. The encore revival production simmers with scarcely containable heat thanks to bristling choreography by Tania Possick. Set in the imaginary town of Agrabah, where palace denizens speak only Spanish and all those relegated to living outside of the palace walls speak only English, the story unfolds in the aftermath of a plot by Jafar, the malevolent Grand Vizier (played by Omar Mata) to usurp the Sultan’s throne after chancing upon a magic lamp and commanding its genie to bewitch Agrabahians and create the language divide. As the only one still capable of communicating in both languages, Jafar attempts to consolidate his power and undermine the Sultan (Henry Aceves Madrid) in order to assert his own authority over the kingdom. Inadvertently, however, the powerful spell has also affected: Rajah (Rosa Navarrete), Princess Jazmin’s pet tiger; Abu (Sebastian González), a monkey who is also Aladdin’s chief companion; and an ominous parrot named Iago belonging to Jafar. All three creatures are suddenly imbued with the ability to understand and speak both English and Spanish. When Princess Jazmin (Valeria Maldonado) ventures clandestinely beyond the palace to escape an arranged marriage, she encounters Aladdin, (Daniel Sugimoto), and the sparks fly, despite his status as a common street urchin. Fortunately, Rajah and Abu fill in as impromptu go-betweens. In the wake of the current U.S. administration’s announcement that it will dismantle DACA, the program to protect immigrant youth and exempt them from deportation proceedings, Aladdin becomes both a thrilling manifestation of a timeless children’s tale based on the legend of Aladdin and the magic lamp and a contemporary treatise on tolerance and humanity. Rather than fearing or reviling difference, the play suggests we should embrace diversity even as it delights us with generous helpings of song, dance, music, and magical fantasy. With an ensemble cast of 24 performers that includes a group of three Royal Translators—among them the magnetic and luminous Blanca Espinoza, exotic and winsome Beatriz Tasha Magaña and glamorously soulful Shanara Sanders—who act as a sort of musically inclined Greek chorus. The trio provides a narrative thread, both visual and auditory, that weaves the play’s various scenes together, even as they move easily in and out of choreographed ensemble numbers comprised of the entire cast and deliver harmonious song lyrics with punchy power and panache. Maldonado, as an insouciant but not pouty Jazmin, is thoroughly convincing as a headstrong Sultan’s daughter who prizes her freedom. Alongside the handsome but humble Sugimoto as Aladdin, she swoons, moon-eyed and dizzy. Together, the pair—both undeniably powerful vocalists—do take on a slight resemblance to a life-sized version of the idealized miniature couple made from molded plastic and used to decorate wedding cakes. But to describe them as simply eye-candy would be a disservice to Tejeda’s role as a director, which manages to extract humor, desire, excitement and heartbreak from almost each of his actors at one point or another. Finley Polynice as the Genie (he alternates with Lewis Powell III in the role), is a genuine, one-man show stopper. Nuanced, bombastic and firing on all pistons which allow him to go from zero-to-sixty in seconds, he humanizes the role and still cuts loose at the drop of a hat to become, if only for a moment, so much larger than life that his energy floods both the stage and the room. 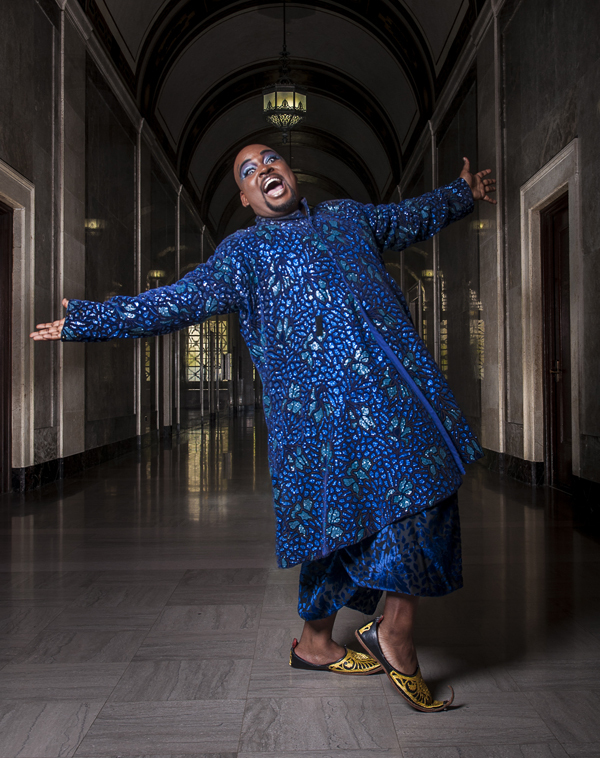 His performance is equal parts Broadway, The Wiz, Las Vegas lounge entertainer and pop-up tent vaudevillian. It is matched at the other end of the spectrum by Omar Mata as Jafar, who virtually oozes a darkly attractive, made-to-order charisma that makes you feel almost sorry for him when he finally gets what he deserves. His simultaneously sinister and tragically comic avian sidekick Iago—played to the hilt by Luis Fernandez-Gil as a kind of foreboding humanoid crow—rolls around all over the stage on sneakers with a single built-in skate wheel nestled discreetly within each shoe heel. Squawking and cawing loudly and unpredictably to intensely comedic effect, Iago is desperate to win his boss’ favor. He is rebuffed and disappointed every time, unlike those in the audience, who offered an enthusiastic standing ovation at the final curtain call then rushed the stage immediately to congratulate their favorite Aladdin characters and snap a selfie with each one. Aladdin Dual Language Edition runs for one more weekend with shows at: 8 p.m. on Fri., September 15 and 8 p.m. on Sat., September 16; 5 p.m. on Sun., September 17; matinees at 11 a.m. on Thu., September 14 aqnd 11 a.m. on Fri., September 15. Tickets are available at www.thelatc.org/ or by phone at 866.811.4111 or 213-542-73072. Closing weekend promotions include two tickets for the price of $39 with promotion code: DUAL. For groups of 10 or more tickets are available at $15 per ticket with promotion code: ABU. Matinee to tickets are available at $10 per ticket with promotion code: MATINEE.